Re: Meeples in a jar. get your guesses in now!! Top Shelf Fun - guesses 99 on twitter! So no one managed to guess the correct number of meeples in the jar but there were some that were fairly close. 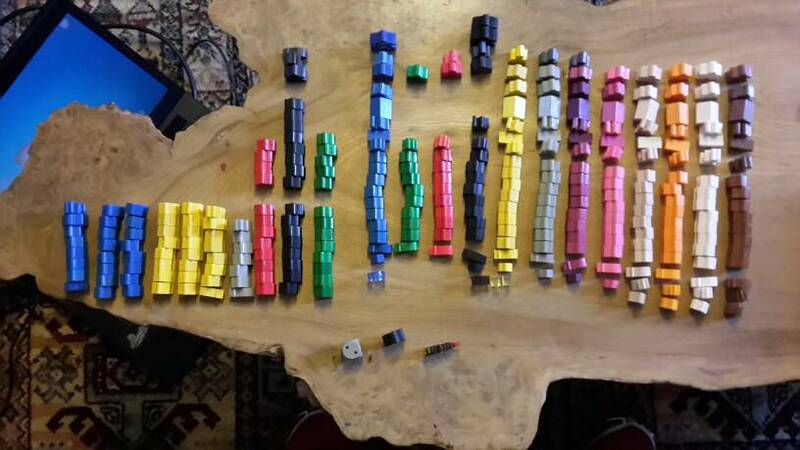 This is a picture of all the meeples laid out and counted. I hope I counted right! 297 meeples of various different types. Andrew Caines with a guess of 303 and second place is Halfling with a guess of 290. Please let me know your addresses today so I can send your prizes out before I leave for my holiday and Andrew, please also tell me your choice. Thank you all for participating - it was fun! I went with the calculated methos of one of every meeple in all the colours available and ended up with 199 +1 for the Wheel pig. Little did I know there would be an extra set of meeples in various colours. Thank you very much for this great contest Rosco. Aww, so close. Oh well . Great competition Rosco! Dan - can you contact Andrew Caines who made his guess via twitter and ask for his address and his choice of prize. Can the fairy be with several Meeples?